Salman Khan and Katrina Kaif are all set to share the screen space in Tiger Zinda Hai. 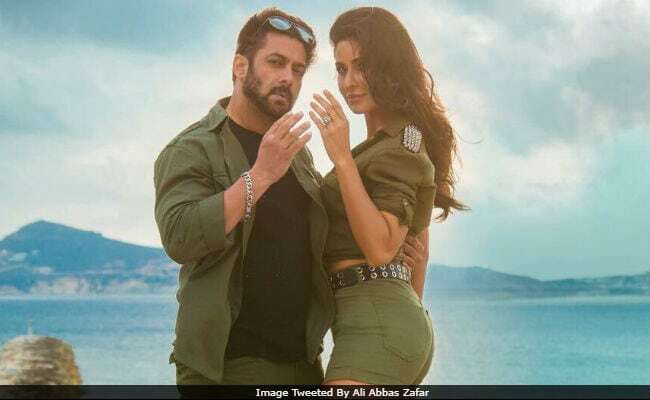 Director Ali Abbas Zafar, who has already made the wait so difficult by sharing new posters from the film, says that Salman and Katrina's on-screen chemistry is 'sizzling.' Recently, Team Tiger Zinda Hai teased us with a rocking picture of Salman Khan and Katrina Kaif from the film's first song Swag Se Karenge Sabka Swagat. "Everyone already knows that both Salman and Katrina have this unspoken sizzling chemistry on screen and what this song does is it exploits it in the most beautiful way," Ali Abbas Zafar told news agency IANS. Salman and Katrina will feature in a film together after five years. They were last seen together in Ek Tha Tiger. Of Salman and Katrina's chemistry, the director told IANS: "In Ek Tha Tiger, everyone had loved Salman and Katrina's chemistry, so for us it was a challenge to push the envelope in terms of how they look and how the song is going to be. A lot of attention has been given in terms of their chemistry, how they are styled and the locations." Swag Se Karenge Sabka Swagat has 100 dancers, including trained ballerinas, hip-hop and Afro-dancehall dancers from Greece, France and Trinidad and Tobago. Ali Abbas Zafar said, "We are absolutely thrilled about that." The trailer of Tiger Zinda Hai was released by the makers of the film, last week. In no time, it took over social media and had garnered over 1.2 million views in nearly four hours. Bollywood stars like Karan Johar, Huma Qureshi and others used words like 'blockbuster,' 'killer' and dhamakedar, to describe Tiger Zinda Hai's trailer. Ali Abbas Zafar has also made 2016's Sultan with Salman Khan. Tiger Zinda Hai is a fictionalized retelling of a real life incident. Salman Khan returns as Indian spy Tiger while Katrina reprises the role of Pakistani spy Zoya. At the end of Ek Tha Tiger, Tiger and Zoya's respective governments had turned against them and they were declared fugitives. But, from the trailer it is evident that Tiger and Zoya are still a team working against a common enemy. Are you ready to watch Tiger Zinda Hai on December 22?